Mention the words “kombucha” and “buzz” in 2006 and you’d likely be referring to the drink’s growing popularity. But mention those same words today and you’d likely be talking about allegations the fermented tea drink contains a small but legally significant amount of alcohol. Kombucha is a fermented tea that is typically marketed as a non-alcoholic beverage, which means that it may contain a trace amount of alcohol, as long as the overall alcohol content is less than 0.5 percent alcohol by volume. In some cases these products have alcohol contents that significantly exceed 0.5 percent. At this point, TTB does not know how many brands might be affected by this issue. TTB plans to take samples of kombucha products from the marketplace and test their alcohol content in order to determine if the products are labeled in compliance with Federal law. If TTB finds alcohol beverages that are not labeled in accordance with Federal law, we will take appropriate steps to bring them into compliance. 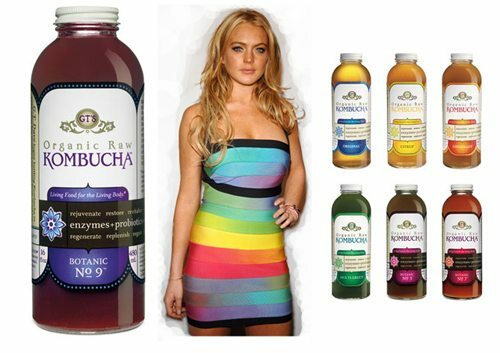 TTB’s kombucha inquiry received some added exposure after Whole Foods pulled the drink from its shelves at the suggestion of TTB and amid news reports suggesting troubled actress Lindsay Lohan’s consumption of the drink may have been responsible for setting off her court-ordered alcohol-monitoring ankle bracelet. Lohan, for her part, recently began serving a 90-day jail sentence a judge imposed on the actress earlier this summer as punishment for skipping mandatory alcohol-education courses. People tried blaming hand sanitizers for setting off the alcohol monitors too – maybe she should try that one next time. It’s frightening to think Whole Foods (or anyone else) is dumb enough to be influenced by Lohans alibi’s. However problem with that product or similar items (such as Russian Kvass ) is that it may leave the manufacturer with a trace of alcohol but unless it is completely pasteurized it may well continue to ferment- there is always a little bit of yeast and fermentable material in such products and so of course with time the alcohol may increase.